Over 30,000 have been slaughtered for Duterte’s drug war but none of them comes from comprador drug lords. Now, even 9 year olds have to be criminalized. While the festivity of the Holy Child was celebrated here in Cebu City this January, the Philippine House Justice Committee, successfully passed the criminalization of children. This was done via the passage of amendments to HB 9344, lowering of the age of criminal liability to 9 years old. Despite the incentivization of law enforcers to apprehend syndicates, Duterte’s police state had lawmakers pursue the alternative solution by taking children as criminals believed to be employed by syndicates to carry out crimes. Again, this is seen as a means to cover up the Duterte Regime’s heinous slaughter of children such as Kian De Los Santos, Joshua Laxamana, Julius Sebastian and Reynaldo de Guzman among others who were murdered or tortured and accused as drug couriers. The same is true with Duterte’s Memorandum Order No. 32 and Executive Order No. 70 justifying joint military and police operations in search, arrests and slaughtering civilian communities to end insurgency rather than directly engaging the insurgents themselves, or even better by rectifying the erroneous semi-feudal and semi-colonial Philippine State. Duterte and his cohorts remain legitimating and sustaining massive killings and attacks at all fronts except within its own ranks, ironically in the name of protecting the state when it is dismembering and destroying the social, political structure of Philippine society. The pattern is that police operational procedures are regularly violated. Hence, the incentivization of ‘rogue cops’ as law enforcement policy is the main stratagem employed regularly. 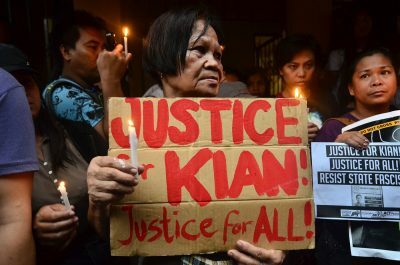 These developments indicate how Filipino legislators today are likewise, unmindful of the absence of criminal justice policies as a realm of democratic governance that is embedded in the Constitution. The Senate, in the same manner, appear to have a lack of understanding of their power to check against abuses of other branches of government. It must also be noted that despite some 30,000 cases of extra-judicial killings under the Duterte Regime, its anti-drugs war never targeted the faucet or source of drug production or the drug compradors themselves, but only small and poor users. Hence, the anti-drugs war is devoid of the sincere and genuine intent of arresting drugs trade in the country but simply appears as a masquerade for Duterte to enthrone himself as the country’s another fascist dictator. Apparently, the policy lowering the age of criminal liability only favors the rich families whose children are not left out to augment incomes for food on the table. The irony is that the state has not even provided the basic welfare for children. It is proven in the current shortage crises of Philippine education, where of the 4 million youths supposed to be in school, had only accommodated 2.3 million. Or, where only 27.7% of the 2.3 million have enjoyed free tuition fee due to its stringent implementing rules and guidelines (IRG). The shortage had sustained the lack of some 130,000 classrooms if 30 student class size had to be implemented, and with same number of lack of teachers items who are poorly paid. The shortage is also felt further with the lack of some 2.5 million chairs and the same number of lack of books covering 8 competencies. Prof. Phoebe Zoe Maria Sanchez is an Associate Prof. of History and Sociology at the University of the Philippines Cebu.